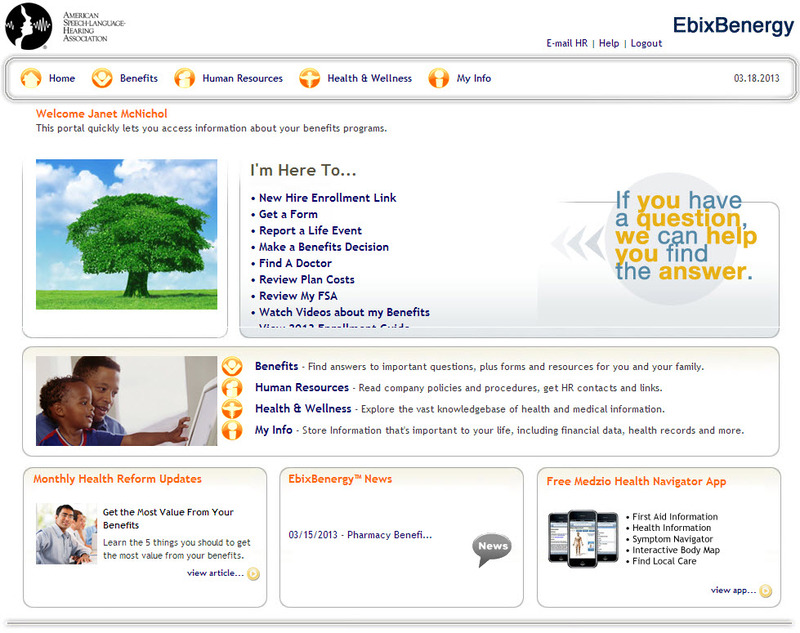 We implemented our first online benefits enrollment system at the end of last year. We were envisioning Turbo Tax for employee benefits. Software that would lead staff logically through a process with well timed prompts and explanations. We started the project early, went through a fairly careful selection process, and pretty much lost our minds trying to get the thing up and running for open enrollment. We recently took a little time to debrief on the whole experience and I thought I'd share the highlights of what we discussed. Maybe this will help someone avoid the pain and aggravation we experienced. We used essentially the same structured approach to decision making that we used when we selected UHC as our health insurance carrier. I described that in detail in this post. We considered Benefits Express, Plan Source, and Ebix. We selected Ebix. We already had a relationship with Ebix having used Benergy to house our benefits information for years. Benergy merged with Ebix in February of 2011 and Fortune Magazine named Ebix the 4th fastest growing technology company in in 2011. Our broker, Mark Sager, is with Alliant and they had selected Ebix as a business partner. Maybe their rapid growth should have been a red flag to us. They seem to be struggling with developing their brand and a lot of integration issues. During the implementation process with Ebix, we had to provide the same information over and over again until we felt like we were in the movie Groundhog Day. And, we had to request the same information repeatedly. I was worried about the feeds to the carriers and that part of the implementation went smoothly. I was probably somewhat unreasonably annoyed when we discussed the W2 reports with them and they repeatedly explained how they wouldn't include information that wasn't in the system. Duh! Ebix delivered the system late, so we were crunched for testing time. They clearly did little to no testing on their end. Benefits were completely missing when they delivered the system. Links did not work. Benefit labels were wrong. We tested, listed what we found and prioritized all the problems that needed to be addressed. Ebix was supposed to launch the system the day before our staff open enrollment meetings and we couldn't get confirmation that it had actually been done before the meetings. We actually had someone from Ebix in our office and he didn't know and couldn't reach anyone to confirm. We should have allowed more time for testing and negotiated penalties for Ebix not delivering the system on time in the contract. Ebix did discount our implementation fee by 25% in the end, but building penalties into the contract may have spurred them to deliver the system on time which is what we really needed. We decided to move our flexible spending account (FSA) administration at the same time so that it could be integrated into the benefits system with a single sign-on. Since we selected Ebix, we contracted with Flexcorp for our flexible spending account administration because they're partners and we thought the integration would be seamless. Little did we know.... The FSA implementation broke down early on and wasn't moving forward. Request after request about the status from us went unanswered. Staff did not receive their benefit cards until after January 1. And, the single sign-on was not set up when the system was launched. After it was implemented, we learned that Flexcorp is optimized with Chrome and Ebix uses IE. Seriously! They present this as an integrated system and you have to use two different browsers. Our broker, Mark Sager, spent so much time working through this with us you'd have thought we were his only client. Mark escalated our concerns early and got a lot of folks at Ebix to keep an eye on our implementation. John Lamb, VP and Group Head at Ebix, flew in to meet with us and discus the problems we were having on November 27. I'm pretty sure it was this kind of special attention from the management team that shepherded us through. On the upside, it's done. The system works. And, all the problems were pretty much invisible to our staff. Prior to the implementation, we outsourced a lot of our administration that we can now do ourselves. So, we also saved about $25,000 a year for all our trouble. Things may have gone more smoothly if we'd have hired a benefits system consultant to help us with the implementation. We wish we would have used a more formal RFP process to minimize some of the over promising inherent in the sales process. Also, we should have checked Ebix's references more thoroughly than we did. Other users may have alerted us to potential problems that we could have planned for. We assigned too much value to Alliant's selection of Ebix as a business partner. We held weekly status calls during the implementation that helped to keep things on track. Dan Fitzgerald at Ebix put together a spreadsheet to track all the outstanding issues which was also helpful. We should have confirmed that all of the pieces of the system were compatible with the same browser. Late in the process, November 13 to be exact, we had a real aha moment when we understood that the Ebix system is built around some very inflexible, single use templates. (They actually forced our individual disability insurance into a parking template.) We don't think this is a smart design, but once this was shared with us, we understood one of the limitations the implementation team at Ebix was working within. We would have saved some time if they explained the parameters they were working within earlier. Focused more on processes that were important to us early on -- implementing a reverse feed from the carriers to consolidate the billing information and converting employees to retirees. We should have made sure we could control the questions asked of new employees. For example, people are forced to state whether or not their spouse works which is irrelevant to us. When staff add dependents, the relationship options include parents, cousins, etc... This misleads people into thinking these family members are eligible for coverage. We should have confirmed that some basic formulas were built into the system. As it stands, people can exceed the $5,000 allowable amount when they elect to participate in dependent care flexible spending. And, when you enter your life insurance beneficiaries, the percentage distributions don't have to total 100%. On the benefits summary staff can print, the total cost of the benefits is wrong, yet the correct total appears on the confirmation statement. Ebix said these were all systems limitations or bugs they couldn't fix. We should have made sure the process for requesting a forgotten log in or password would be easy for our staff to handle independently. We should have reviewed a training plan before signing a contract. They forced us to go through some training before they would deliver the system, but the training was irrelevant because it was designed for an organization that did not use data feeds. This was just a meaningless hoop for us to jump through at a point where we truly didn't have the time to spare. Our Learning Facilitator, Terry Harris, did a great job introducing the system to our staff. She held many sessions in our computer lab where we helped people walk through the enrollment process. She also played a key role in the testing and drafting of instructions for staff. You definitely need both a testing and a training plan if you take on a project like this. Emily Wang, our HR Generalist, took on the brunt of this work. She demonstrated a keen knowledge of all the details of our plans and had a strong systems background to make sense out of all the talk of the feeds and back end stuff. If you don't have the systems expertise on your HR team, recruit someone from your IT team to work with you.